We’ve recently begun a new year, and this year we need to be as stylish as ever. “New year, new me,” so you can’t just jump into the new year wearing a pair of old dress shoes that look like something your grandfather would have worn, or at least, not unless they are a fashionable style that never goes out of style. But what do people mean exactly when they say, “dress shoes”? Generally, these are shoes you would wear with a suit or something elegant. When it comes to dress shoes, there are certain types that dominate. These can be dependent on the event or occasion they’ll be worn to and also the wardrobe there’re to be paired with. For most men, the Oxford shoe will pair well for most occasions. 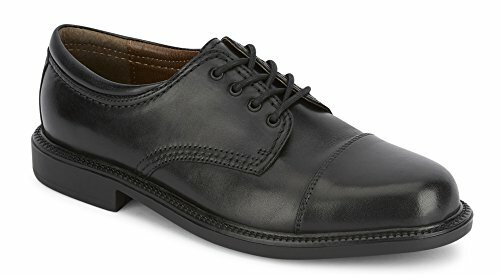 Meant for formal gatherings, a pair of Oxford shoes for men is something that should not be missing from any shoe closet. 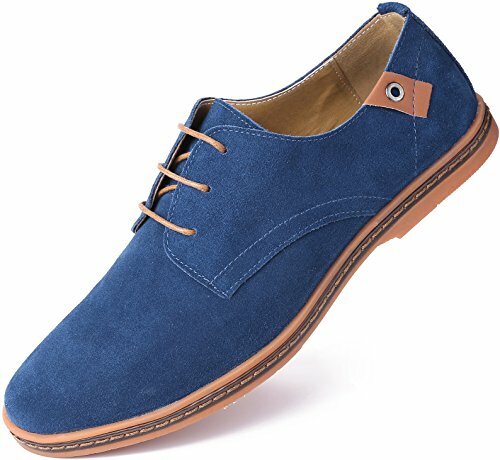 You can also go for casual dress shoes made of fabric, suede, or any other kind of “casual” material. 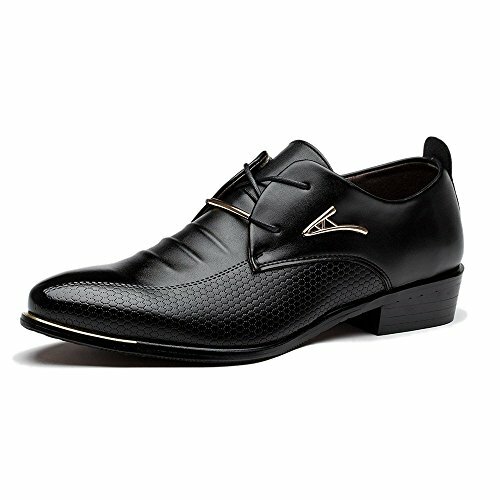 The advantage of these shoes is that you’re not limited to a tuxedo or suit and that you can even wear them with jeans. It all depends on your personal sense of style. Speaking of style, what are some models that men don’t seem to get tired of? Well, have a look at some of these most recent popular dress shoes that are available. If there’s anything that we know about famous designers, it’s that they never go out of style. Mixing a diamond-textured pattern with sleek, beautiful black leather, these shoes are still one of the top choices that people decide to take on a formal trip. Plus, the square toe is unique and elegant and will offer a nice, special touch to each and every one of your outfits. With a combination of detail and smooth leather, these shoes will be able to provide the style you’re looking for while still remaining professional. The toe is pointed, drawing more attention to the shoes themselves and the laces are simple and easy, providing a nice touch. The synthetic sole is also made to be durable and comfortable, making them easy to wear. 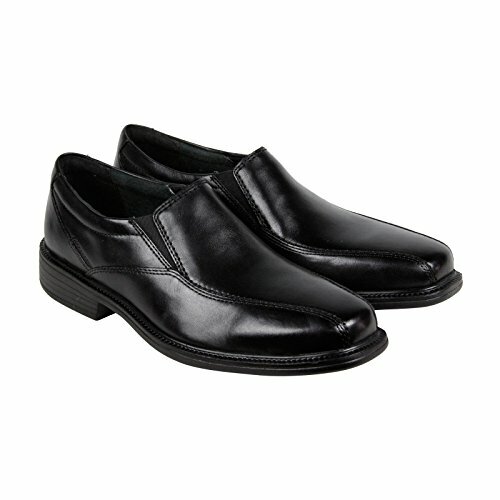 Black is always in style, which is why this Kenneth Cole is also a popular pair. They’re even more popular thanks to the fact that they use monk straps instead of shoelaces, which makes it easier for you to take off your shoes and put them back on. Plus, they can be slightly more attractive than shoelaces, so we can understand why they are popular. With these shoes, you’ll surely be able to obtain a more regal appearance, seeing as they vaguely resemble something royalty would don many years ago. The heel also does a small amount to add to overall height without drawing too much attention to the addition of a chunkier heal not often seen in men’s shoes. 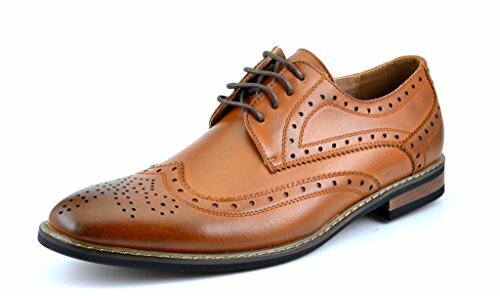 Wingtip dress shoes are also a popular choice that men decided to bring into the new year, which is why this Dream Pairs model is so popular. Plus, the perforated leather design makes it perfect for those who walk around a lot. Not only are they very stylish – but they are extremely practical as well. Plus, you have several color options to choose from. The addition of the wooden heel makes them durable, and the design of the laces makes them easy to slide on and off. These shoes are also going to be able to work well with a larger variety of clothing styles than some other options, meaning that you can spruce up casual outfits with these shoes just as well as a suit. Those looking for both comfort and style might be happy to know that the Seakee shoes are still highly stylish. While these shoes are made from PU leather (a manmade leather made using leather combined with polyurethane), which is known for its elegance, they are also casual enough to be worn with a pair of everyday trousers or jeans. Practical shoes that you can wear just about anywhere will always be in style. Some men dislike shoes that make their feet look as if they are shrinking as they reach the toe. They like pairs that have a little more substance, which is why this Dockers pair is considered very stylish. Indeed, they still have the Oxford look, but the toe cap is wider, rounder, and expresses much more power. 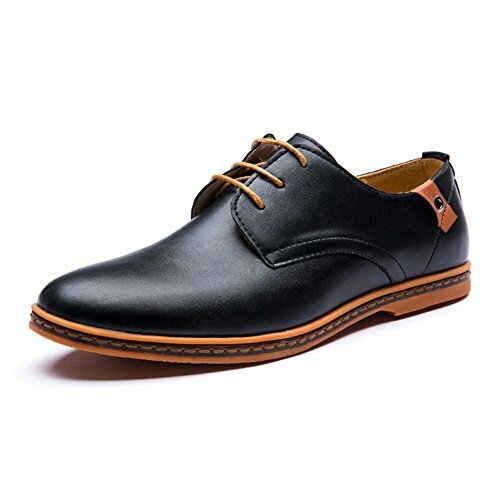 These shoes are unique in that they bring together the look of a more durable work shoe and the style of a dress shoe. Because of that, you’ll be able to wear them in meetings and more laborious areas as well without having to worry that they’ll fail in either. The thicker leather material will also help them to last a long time. 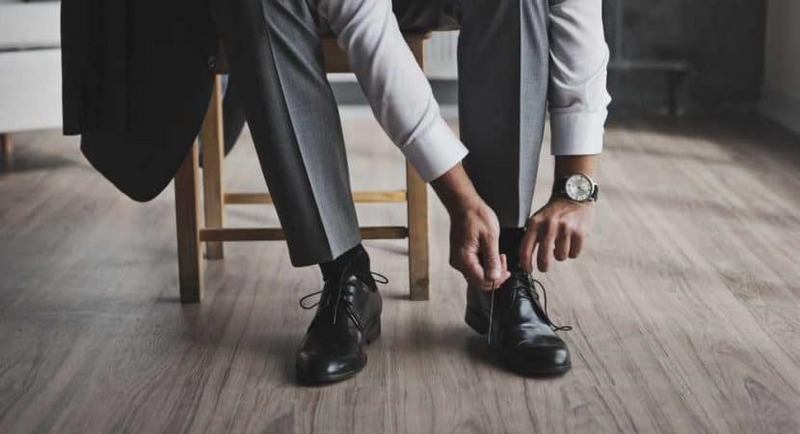 Dress shoes that have a sporty look are still in style nowadays, especially considering how everyone is struggling to fit in an extra workout. Shoes that are comfortable will never go out of style – and while sneakers and suits have always been frowned upon, people still managed to find their way around them. Now we simply just can’t get enough of them. 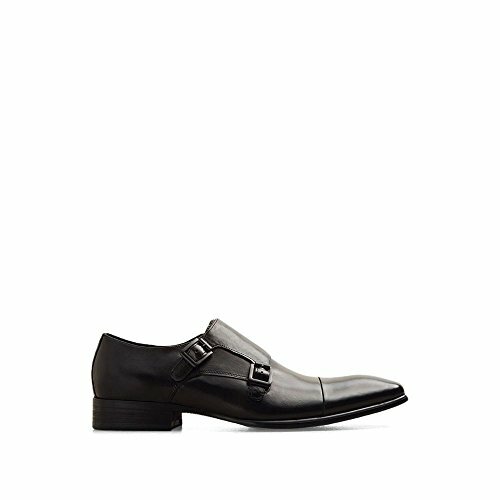 For those who are looking to stand out a little more in the office, these shoes are a great way to do it. They’re also made to be very flexible and breathable so that you’ll be comfortable wearing them all day. For those who need shoes that match their style, these are also available in a number of colors. 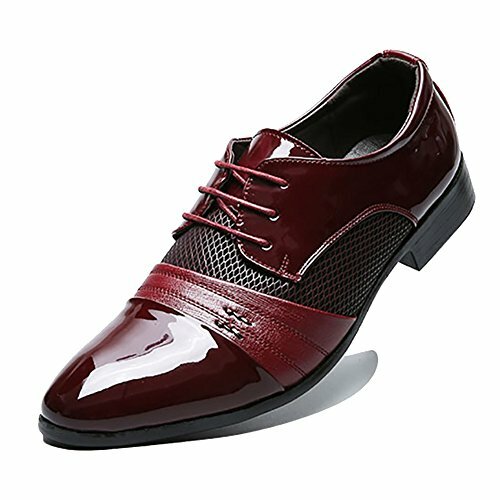 We live in a time when we like to add color in our lives – so why not add a pair of red oxford shoes into the mix as well? This pair is popular not only because it’s breathable and summer friendly, but because it’s also lively and colorful. There’s no place for boring stuff in 2018, which is why these shoes still remain in style. These are a great choice for those who want to stand out while maintaining a professional appearance. They can make the office a little livelier, and help you feel more unique as you go about your day. Furthermore, you’ll be able to get a lot of comfort from these shoes do to their breathability. Once more, dress shoes that can be worn with just about anything will always stay in style. There’s nothing more practical than a pair of shoes that you can wear both at work and a fun night out. The Martino shoes are perfect to be mixed with both jeans and tuxedos, which is why they are still considered to be in style. Many tend to prefer dress shoes with a simple but stylish appearance. The gradient that leads from the main section down toward the toe in some varieties can also draw the eye. For further ability to adapt these shoes to just about any style, there are a wide range of colors to choose from. Time is money, which is why you shouldn’t be wasting it on shoelaces. This is exactly why slip-ons such as the Bostonian leather dress shoes are still in style. Simple and with no other extra inconveniences, all you have to with these dress shoes is slip your feet in and you’re good to go. No shoelaces! This is exactly why this particular model is so popular. With an elegant simplicity, these are fantastic for those who just want to look good and not have to worry about receiving too many comments on their shoes. The added stretch in the top also makes them easy to put on and wear comfortably. The classic look will always be fashionable, but it’s always better when you also give the dress shoes a modern twist. 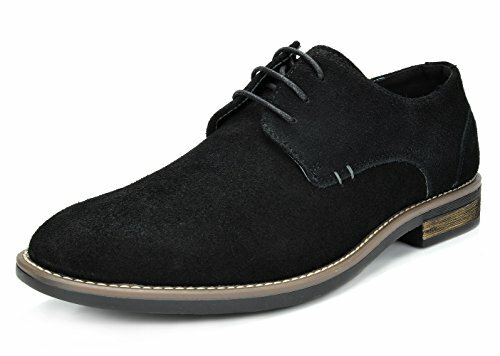 Made from suede leather and having a wingtip design, these dress shoes are very popular among men for smart casual or formal events. Plus, with the right clothing, you could also wear them on a regular night out. For those who prefer suede to leather, these are a great option. In combination with the classic appearance, they also come in a wider range of colors so that you can get what you need to suit just about any outfit. When in doubt, always go for Oxford. This classic design will never go out of style, especially when you have a formal event coming around. As a youngster, you could go for something smart casual, such as a suede pair with a colorful design. On the other hand, if you are on the more formal, “somber” side, the classic full-grain Oxfords are still popular and trendy, a welcome addition to keep in your wardrobe.